Pfiffel’s Pet Preview is a useful tool that simulates various aspects of pets. Pets are allies which follow the player throughout the realm. They have no HP and do not absorb enemy projectiles, but they have abilities which benefit the player in battle, such as healing the player or attacking enemies. Pets do not disappear when a character dies. They will just return to your Pet Yard. Multiple characters owned by a unique account are able to choose the same pet to assist them in combat. Pets are a crucial part of the game. It is recommended to hatch and level up pets to fully enjoy the game, as they allow you to play the game without having to keep a close eye on your health at all times. Heal and Magic Heal are the two most useful abilities to have on your pet. You should aim to have Heal as your first ability and Magic Heal as your second ability (or the other way around). Pets come from Pet Eggs. Pets Eggs are dropped in egg baskets (seen above) by Lesser Gods, Gods of the Realm, Event Gods, and Dungeon Bosses. Pet Eggs can also be purchased in the Nexus Shop. Pet Eggs can only be used in the Pet Yard, and when used the egg will disappear and spawn a pet. If the rarity level of the egg is two or more tiers higher than what the Pet Yard can hold, then you will be unable to hatch the egg. A portal to your Pet Yard can be found in the Nexus and in your Vault. Like your Vault, only you can enter your own Pet Yard. In the Pet Yard, you can hatch Pet Eggs to get pets, feed pets to level up their abilities, fuse pets to increase their rarity level, instruct pets to follow or unfollow you, and release pets to get rid of them. The Pet Yard can contain up to 50 pets. If you already have 50 pets in your yard, Pet Eggs will not hatch, and you will need to release a pet to make room. Initially, the Pet Yard’s maximum level is Common. If the pet’s rarity is above that of your pet yard, you will be unable to feed the pet. Your pet yard needs to be one tier above your pet’s tier in order to attempt a fusion with that pet. A pet has three abilities which are unlocked depending on the rarity level of the pet. The first ability will always be available. The second ability is unlocked at Uncommon rarity and the third at Legendary rarity. There are nine pet abilities. The strength and the frequency of ability occurrence depend on the ability level. Feed your pets to level up their abilities. The absolute level cap on abilities depends on the rarity level of the pet. A pet’s ability level cap can also depend on the ability level of the pets it might have fused from (see Pet Fusing). Feed your pet any unwanted items to increase the levels of their abilities. 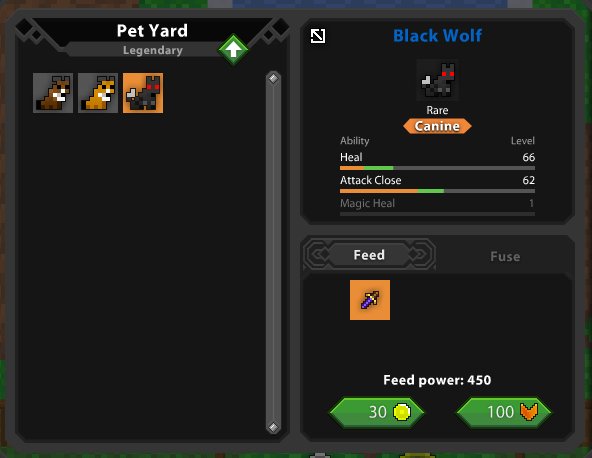 All items have a feed power value, which is displayed in the item description. Food items for your pet can also be bought in the Nexus, or rarely dropped from enemies under certain conditions. In order to feed a pet, select the pet you want to feed on the left of the interface, select what items you want to feed your pet out of your current inventory, and click on either the fame or gold icon indicated to spend the designated amount of fame or gold to feed your pet. An item’s feed power value is applied in whole to all unlocked abilities. In other words, feed power values are not divided between abilities. Your backpack inventory will not be seen by the interface, so you will need to move the items you intend to feed from your backpack to your main inventory before entering the pet yard. Feeding a pet requires a fame or gold cost that depends on the rarity level of a pet. It is recommended to feed items that have high feed power, in order to maximize your efficiency of the fame you spent. You can feed your pet up to eight items in a single feed action. The cost to feed your pet is applied to each item; in other words, to feed your uncommon pet three items at once, you will need to spend 90 Fame or 36 Gold. 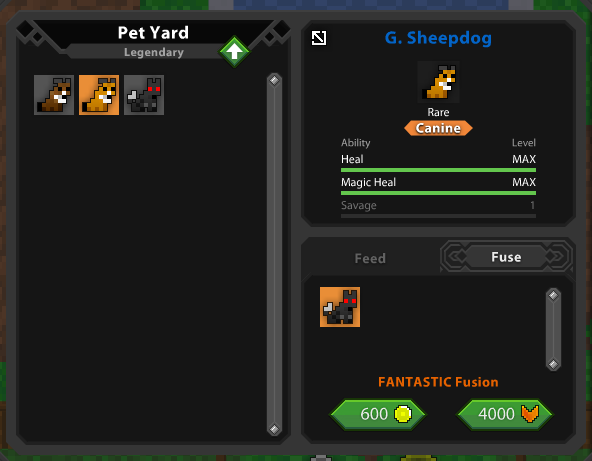 In your Pet Yard, you can fuse one pet into another to upgrade its rarity level. 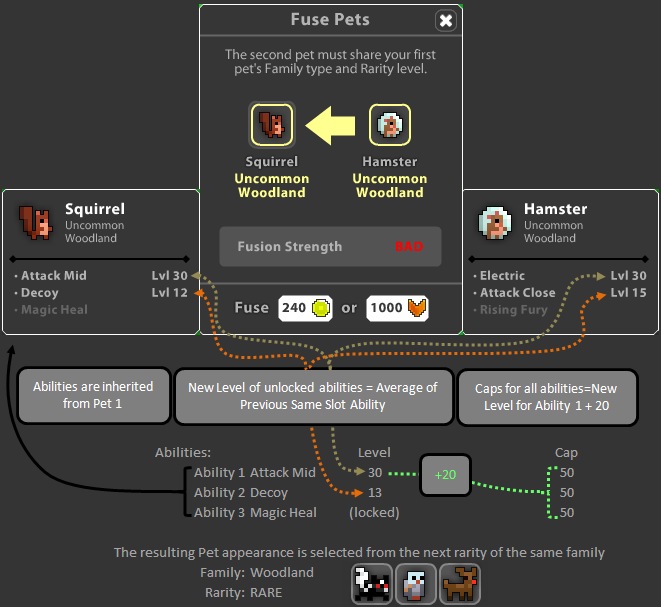 In order to fuse, the two pets must be from same pet family and have the same rarity level. As said before, your pet yard must also be at least one tier above the pets you intend to fuse. In the fusing window, the pet you selected on the left of the interface is the one that will remain after the fusion, obtaining the rarity upgrade. The pet selected on the lower right corner of the interface is the pet that will be consumed in the fusion process. When fusing up to the Rare or Divine level, the appearance of your pet will change. The ability level cap of the resultant pet will depend on the levels of the two pets’ first abilities. Fusing two pets who both have their first ability maxed (MAXED strength fusion) will result in the highest possible level cap for the new pet. It is generally advised to fuse pets only when all their abilities are fully maxed. There are 14 Pet Families. In order to fuse two pets, they must be from the same family and have the same rarity level. 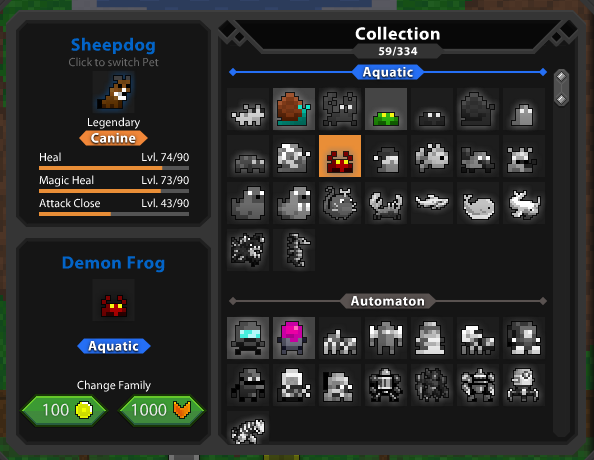 For each family, Common and Uncommon pets have the same sprite assortment, Rare and Legendary pets share another sprite assortment, and Divine pets have their own sprite assortment. The Pet Wardrobe is used to change the appearance and even the family of your pets. Pet Abilities and Pet Rarity Levels will stay the same. Changing your pet’s skin or its family comes at a cost. It costs 200 Fame or 20 Gold to change your pet to a different pet within the same family. It will cost you 1000 Fame or 100 Gold to change your pet to another pet from a different family. A Pet Skin item is used to unlock a skin that your pet can be changed to in the pet wardrobe. The item is consumed with use, but it will not immediately change your pet’s skin. Note that the appearance change associated with fusing your pet will replace your current pet’s skin with another skin associated with the rarity and family of the pet. This change is reversible at the costs mentioned above, if you preferred how your pet looked previously. Unlike most other pets, vanity pets have no relation to the mechanics of the Pet Yard, and can be used alongside a traditional pet. Prior to release 12.0.0, pets were aesthetic only (had no abilities), and could only be obtained using Realm Gold. For information about pets as they existed before functional abilities were implemented, refer to Pets Prior to Release 12.0.0.